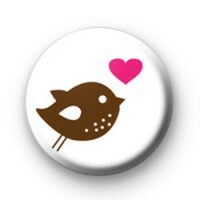 This button badge is of a small bird and a bright pink love heart. We have nicknamed it the love bird and think it makes a lovely handmade Valentines badge. It is a really sweet romantic badge and one that is subtle and pretty. Our Valentines, love and romantic themed badges are perfect for giving to the one you love on February 14th or even on your anniversary or as a special gesture. There are so many possibilities with our 1-inch badges and we are proud that they're handmade by us in the UK with love.